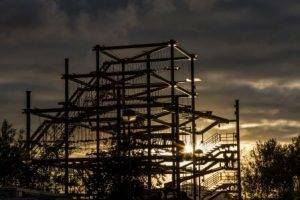 Innovative Leisure has installed a 17m high, 4 level high ropes adventure course at The Tees Barrage International White Water venue in Stockton on Tees. Tees Active Leisure, operators of the venue in conjunction with Stockton Borough Council, has added the new Sky Trail High Ropes Course in readiness for the 2016 season. The structure is built on a peninsular in the middle of the River Tees. The 4 level, eight pole high ropes system has more than 40 activity elements between 4m and 15m off the ground. Levels 3 and 4 are certainly not for the faint hearted! The course can cater for up to 70 participants per session, with 60 participants able to enjoy the main Sky Trail experience at any one time. Additionally, this ‘zip experience’ installation also features the UK’s first Sky Rail, the latest in zipping technology. The fully automated zipping experience runs parallel to the course and features two Sky Rails on levels one and two which allow for users to zip from one launch pad to the next without disconnecting from the system. Those with younger children can also enjoy the 6 pole, 9 element Sky Tykes course, a scaled down Sky Trail for those aged from 2 years old and under 1.22m.